This photo is all action. 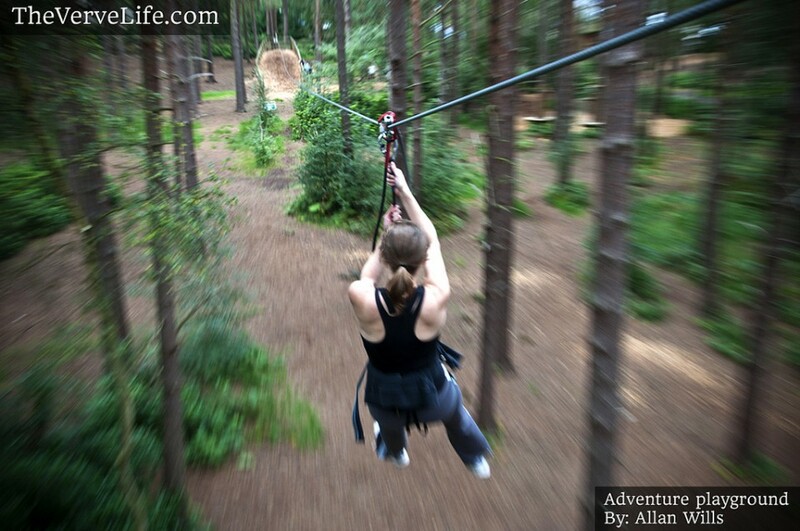 I took it during a day out with friends at Go Ape – an activity consisting of climbing, swinging and zip lining along the tree tops. And by the way, I used no special effects. In this photo, the essence of the day was captured; a body in motion high above the forest’s canopy. I wanted to capture a sense of the environment, and our height above the ground, but also a sense of speed, movement and excitement. That’s a lot of elements to capture… and what is more, I was also a participant in the Go Ape, so I didn’t have time to setup up any shots. I had my SLR and zoom lens strapped to me, and between swings and zip lining I had to shoot on the move! Not all “still” photography has to be still. Learn a few tricks, and motion can become art in your photos. As you can see, this photo very much has a sense of motion – the trees look as if they are zooming around the subject. I say again: I used no special effects in post production, this was all captured in camera, in the moment. 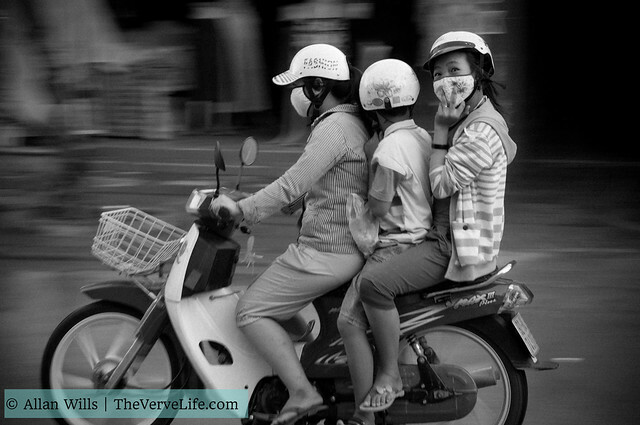 The trick is called a zoom blur. As my friend jumped off the platform to begin her descent down the zip line, I had her firmly in the center of my frame. Then as I released the shutter, I spun the barrel of my zoom lens and voila; it gives the effect of a speedy blur around the subject. It’s a neat trick, but also a difficult one to time correctly. Firstly, you need to work with a shutter speed that is not too slow as to have camera shake ruin the photo, but not too fast as to freeze the action without allowing a bit of motion blur. It all depends on the speed of the subject, but generally speaking that sweet spot is a shutter speed between 1/15 to 1/60. Then there is the act of pulling the zoom to cause the motion effect. Pull the zoom barrel too fast, and everything in frame will just be a streak. Pull too slow, and everything will be a blurry mess. So it does take a bit of practice, but once I compose my shot (moving subject in the center) and start snapping the movement, I often do a series of bursts (4-5 frames a second) while constantly pulling the zoom barrel in and out. If all goes well, I might get one great shot out of a tight series of 5 or 10. And I could do all of this while Going Ape, because I had practiced it so many times. Here is another example of the technique, this time in New York city. I’m on top of an open-top tour bus, and the traffic below is grid lock. But with the right shutter speed and a swivel of the zoom barrell, you see the effect: I express the true spirit of New York; still but always moving. 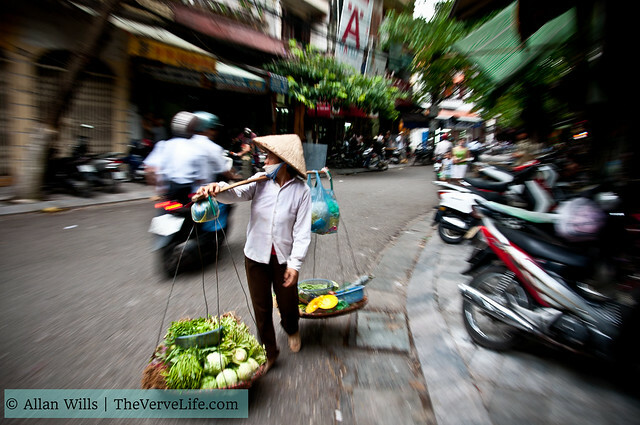 Below is another example from Vietnam of how to get motion blur in your photos, only this time I’m not swiveling the zoom lens – I’m simply panning the camera at the same speed as the scooter and keeping the subjects centered as I snap. Here’s another example from Vietnam of a street vendor in Hanoi. 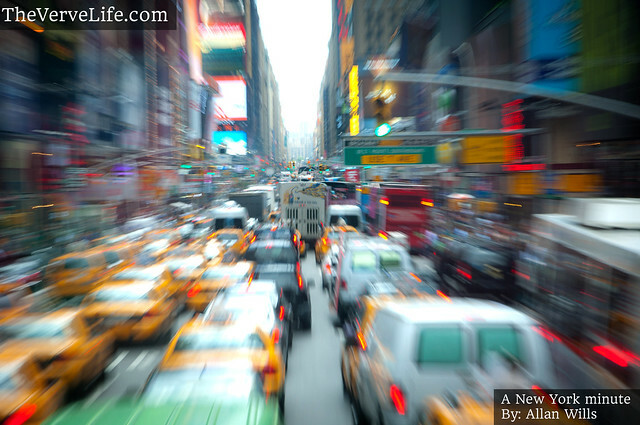 The zoom effect is very light, but it still adds some “bustling city ambiance” to the scene. Still photography may have the word “still” in it, but it doesn’t mean pictures can’t feel like they’re moving.